Sonesta Philadelphia is a newer addition to the Philadelphia skyline located right in the heart of downtown. 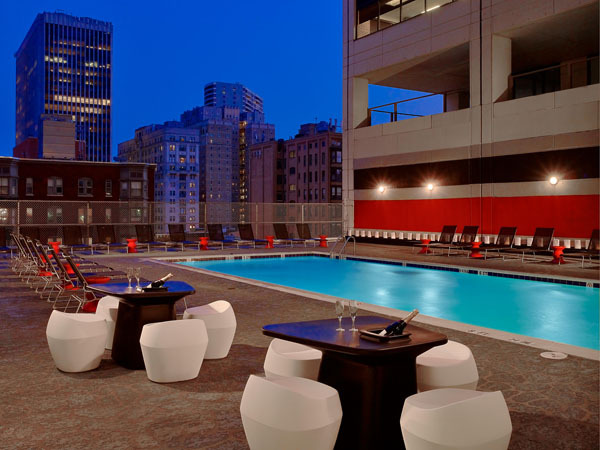 Its fresh and contemporary vibe sets it apart from other hotels in the city with a convenient location within walking distance of the Convention Center, Financial District and Rittenhouse Square; a perfect hub to explore the city for business or leisure. 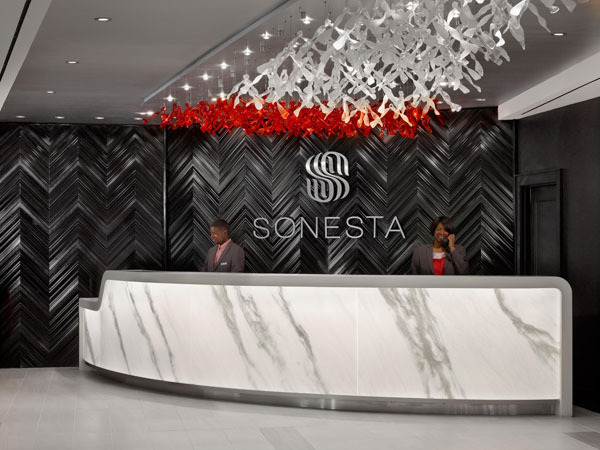 Adding to the cultural flair of the Sonesta is their signature ArtBar that curates collections from the finest local contemporary artists around Philadelphia in the in-house gallery and features an art inspired menu. The creativity is not limited to what adorns the walls, because all dishes are made with art in mind, as well. Every night from 5-7 PM guests can experience the ArtBar’s “Liquid Art” happy hour filled with artistic libations named after famous artists. Paying tribute to the arts, the Sonesta Philadelphia is a large supporter of The City of Philadelphia Mural Arts Program, which is the nation’s largest public art program. The program has united artists and communities through a collaborative process, transforming public spaces and individual lives, for three decades. The hotel itself is home to the city’s record-breaking tallest mural designed by MOMO, which is located on the front of the building. Take time to enjoy the Sonesta’s fine dining facilities such as their latest addition of Ruth’s Chris Steakhouse serving some of the best USDA prime steak in Center City Philadelphia, serving lunch, dinner and a recently added brunch menu. 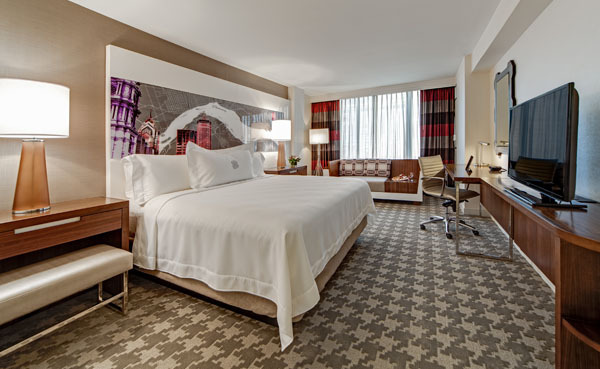 After a day of sightseeing and cultural immersion, the Sonesta Philadelphia is a luxurious haven to rest and rejuvenate. Their spacious and modern rooms are luxuriously outfitted with a clean structure awash in pastel shades suites. A seasonal rooftop pool serves as a relaxation zone to enjoy the sun, while the 24-hour on-site fitness center lets guests work off stress. 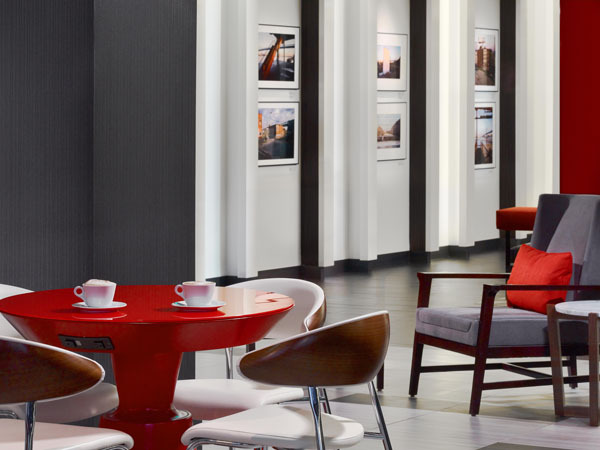 With their prime location in the heart of the arts and cultural downtown, the Sonesta Philadelphia is perfect base for arts and culture aficionados who have an appreciation for the best of what Philadelphia has to offer.